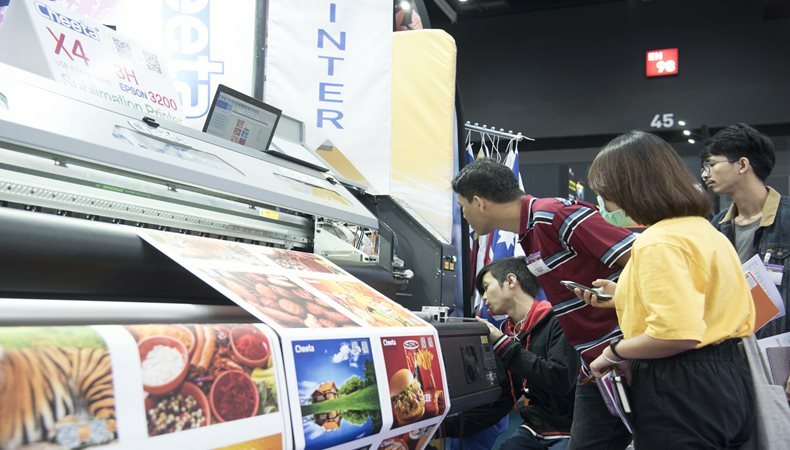 Asia Print Expo 2019 took place from 21 to 23 February in Bangkok, Thailand and has been hailed a success by both visitors and exhibitors, cementing the event’s position as a leading meeting point for Asian screen, digital and textile printers and signage. 4,501 individual visitors travelled to Asia Print Expo 2019 from 54 countries. Taking into account visitors attending the event across multiple days, the show attracted a total of 4,681 visitors, an increase of 8% compared with FESPA Asia 2018. Visitors from the host country, Thailand, made up 80% of the audience. The other top ten countries were China, Korea, India, Japan, Malaysia, Singapore, Indonesia, Philippines and Sri Lanka, underlining the event’s reach in the ASEAN region and beyond. Exhibitors commented positively on the seniority and purchasing intent of visitors, reinforced by FESPA’s own visitor data, which shows that 68% of delegates were business owners or hold senior business positions and 83% of attendees were decision-makers or involved in the decision-making process. Asia Print Expo’s conference sessions were well attended, with 540 visitors joining the 21 seminar sessions across the three days, highlighting the demand for specialist knowledge in the region. This was emphasised by that fact that 43% of visitors stated that their top reason for attending the exhibition was to update their industry knowledge, followed by 21% who said they wanted to discover new products. The Wrap Masters Asia event took place at Asia Print Expo, with 33 contestants battling it out to be regional champion. After three action-packed days where competitors were tasked with wrapping cars and helmets using Hexis vinyl products, Rendra Angga Agung Azka from Azka Wrap, Indonesia, took the Wrap Masters Asia title. He will now go on to compete in the World Wrap Masters Series Final, which takes place at Global Print Expo 2019 from 14 to 17 May in Munich, Germany. Second and third place went to Eakkalak Tadnumtong from AkeSticker Shop and Kittisak Siriwarangkun from VR Wrap Shop respectively, both from Thailand. The competition gave the wrappers the opportunity to show off their skills, connect with fellow installers and learn new techniques.